A dairy farmer based near Ashford, Kent, has been ordered to pay £1,500 plus £5,516 in victim charges and costs by Maidstone Magistrates’ Court, after being found guilty of discharging slurry into a local watercourse. 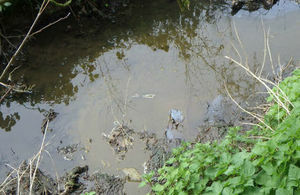 The Environment Agency brought the charges against Mr Peter Joules of Bircholt Farm, Bradbourne, Ashford, Kent, after its officers discovered a spill of neat slurry from an overflowing slurry lagoon that reached the stream. The officers then found that there had been a longer spill of dilute slurry and dirty water from livestock gathering areas that was also polluting the watercourse, via an underground pipe. In March 2017, Environment Agency officers were inspecting a tributary of the Aylesford Brook when they discovered slurry running into the stream, and traced it back to the slurry lagoon at Bircholt Farm. They then discovered a black pipe discharging a brown liquid around 200 metres further upstream. The pipe was part of farmyard drainage system that discharged rainwater and yard washings. The pipe allowed diluted slurry, chopped straw, animal feed and soil sediment to enter the stream. Environment Agency officers took samples from the stream and found the water quality was heavily impacted by the two discharges. The EU Water Framework Directive (WFD) sets limits for what is considered ‘good’ water quality. The WFD levels for biological oxygen demand are 4.0mg/l, yet those found in the sample were 463mg/l; 115 times the limit. For orthophosphate, the level is 0.12mg/l, but the sample returned 15.2 mg/l; 126 times above the limit. Good farm management is vital to avoid incidents like this that damage the local aquatic environment and harm wildlife. We take these incidents very seriously and do everything within our powers to safeguard the environment and people that may be affected. Mr Joules’ farm didn’t have the infrastructure to deal with the slurry it produces, which caused a serious pollution incident. In these circumstances we do not hesitate to prosecute. Mr Peter Joules of Bircholt Farm was charged under: Environmental Permitting (England and Wales) Regulations 2016 Section 38(1) It is an offence for a person to (a) contravene regulation 12(1) or (b) knowingly cause or knowingly permit the contravention of regulation 12(1)(a) Section 12(1) A person must not, except under to the extent authorised by an environment permit, (a) operate a regulated facility, (b) cause or knowingly permit a water discharge activity or groundwater activity. Mr Joules received a £600 fine for the black pipe and £900 fine for the overflowing slurry lagoon.